The rivalry between mainstream medicine and homeopathy, focusing on the quixotic endeavors of Royal Copeland, its standard-bearer in the US. If modern homeopathy works as its advocates claim, it’s the medical magic bullet. Most of the controversial alternative therapy’s remedies are very inexpensive and so dilute that side-effects are negligible and overdose is impossible. But although the discipline has existed for more than two centuries, as Robins (The Girl Who Died Twice, 1995, etc. ), states, “Very few of the remedies have gone through extensive clinical studies, and scientific proof is only a distant possibility.” There are arguably benefits of homeopathic practice, but some of its core tenets, especially “potentization,” are alarmingly dubious. A major portion here details the efforts of the American Medical Association (AMA) to hold the American Institute of Homeopathy (AIH) to clinical standards of efficacy, and covers the AMA’s efforts to discourage the practice of homeopathy, often putting homeopathic physicians in the category of “cultists.” The AMA was largely successful. By the turn of the 20th century, there were 20 homeopathic medical colleges in the US, but by 1930s they had all closed down or converted to conventional medicine. In many ways, homeopathy's cause is a mythical one and Copeland's story is a noble but futile one. Yet this is not the compelling, colorful narrative that could be expected in a work featuring a turn-of-the-century alternative physician who also served as a US senator from New York. This most often reads like a very long encyclopedia entry. 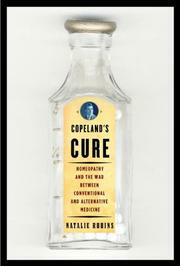 In her bid to provide an even-handed deliberation, the author lays out the bare facts, often resembling a long encyclopedia entry, of Copeland's undertaking without editorial comment or even dramatic structure, yet her position is clear: Maybe homeopathy could prove its worth. Or maybe not. Interesting as medical history, not so much as medical literature.